In my reading of J. M. Coetzee’s The Lives of Animals, I find an interesting discussion about Wolfgang Köhler’s study of the mentality of apes. Coetzee’s novella and the ensuing opinion pieces by Marjorie Garber, Peter Singer, Wendy Doniger, and Barbara Smuts provide various perspectives on the issue of animal rights. But, from reading about Köhler’s study, I am struck by something else which is subordinate to the novel but of paramount importance to my day-to-day work. Why is he starving me? Why has he stopped liking me? Why does he not want these crates any more? What miconception causes him to believe that it is easier for me to reach the banana hanging from the wire than it is to pick it up from the floor. I commiserate with Sultan, because every day I think of “wrong” thoughts – wrong ways to attack a research problem; syntactically correct, but functionally inefficient ways to write code; wrong assumptions in a derivation; starting with a useless hypothesis; right paths to the wrong solution; wrong paths to the right solution. Sometimes, this becomes endlessly frustrating, and I often wonder how one is supposed to “think the right thought”, in the context of problem-solving. Motivation alone does not do it: Sultan may become hungrier by the minute, but his brain must know beforehand that a crate can be stood upon. I could be incredibly motivated by an approaching deadline, but I can’t solve a problem, if I don’t know the underlying theory. Knowledge wedded to motivation is also insufficient at times: Sultan might know that he can stand upon a box, but he needs to remember a previous experience of having stood up on something in order to reach for something else. I was once asked a complicated probability question in a 10 minute oral exam. Approaching the solution from first principles would have been nearly impossible (for me at least.). I could solve it only because I knew how to begin, having previously practiced several problems which had been formulated similarly. Next, is the ability to form connections. We can only go so far by referring to old problems. To generate new problems and to solve them, one must be able to connect the motifs from old problems with those in the new problem, and to extrapolate the old ideas up to a point where they convey some new information. This, of course, requires a certain amount of innate intelligence. But this is still not the whole story. Intelligence is used to form connections by taking recourse to logic (If A then B, then C, and so on). But it is also used to jump over obstacles, to see the solution before we have arrived at it, by means of intuition. If Sultan has never seen a box before, has never stood upon something before, could there be any way in which he would just “guess” that the top of a stack of crates is closer to the bananas? This phenomenon occurs all the time in some fields of mathematics. The mathematician guesses – by a process that is sometimes logical and sometimes not – that the answer to the problem is X, and then proceeds backwards to prove that X is the correct answer. Of course, he has to be rigorous and check whether X is the only possible answer or just one of a number of possibilities. A great many mathematical results are proved in this way. I have a new-found admiration for the restraint necessary in such situations – the ability to not get carried away by the intuited solution, to not confuse cause and effect. Last week, in a fit of inspired guesswork, I wrote down a certain result and then proceeded to prove it. It turned out that the result was correct, but due to haste, carelessness, and inexperience, one of the arguments in my proof was completely bogus! I didn’t realize it until I explained it to a friend who pointed out the embarrassingly obvious error. For a faculty that we exercise so much and so often, it is ironic that thinking the right thought should be so hard. Have you read William Boyd’s Brazzaville Beach? It’s a fantastic novel about the scientists observing a group of gorillas – full of science and anthropology and the human quest for knowledge and power. I think you’d enjoy it. Thanks for the recommendation litlove. I think I will enjoy this. I’ll also pass this along to a few friends of mine, who are very interested in these topics. Now that I am done with Coetzee’s story, I am reading the ensuing opinion piece by Singer. I liked the book because, instead of looking at the animal rights issue in a moralistic or religious or absolute way, it tries to address some very legitimate opposing viewpoints – some of which I hadn’t considered in too much depth. E.g., Are animals as afraid of death as human beings are? Does this make the killing of animals more permissible than the killing of humans? Maybe, I will write a post about this soon. I remember my History teacher fiddling with one of those little hooks that can move on rails above the blackboard, in order to hang a large map of Asia. The hook was stuck, so that the distance between the two hooks did not match the distance between the corner-holes in the map. He stopped fiddling with the thing for a little longer than the time it took the class to understand that it was stuck for good, making us a bit impatient. Then he climbed down his chair, moved it under the other hook, which he slid the other way by the proper amount. He hung the map and said proudly: ‘You have just witnessed the superiority of the human mind over monkeys. Had I been a chimpanzee, I’d probably still be trying to move that hook’. Reading your post, it occurs to me that human intelligence is probably the ability to think not five, not ten, not twenty thoughts when faced with a new problem, but probably a thousand or a million, and follow-up on these thoughts and connect them with one another or with whatever bits of experience we have, until we get close to a solution. This unconscious process of feeling the solution-space with the widest set of mind-tentacles and reacting ‘ding!’ when one of them touches base we call intuition. Your description of how intuition is at the heart of mathematics is great. What I find sad is the amount of time mathematicians then spend turning the process backwards to hide the magical intuitive nature of the discovery, and write the proof as if it was the result of a one-directional conscious construct, in the dullest and formallest possible way. Mandarine: Your definition of intuition as an “unconscious process of feeling the solution-space with mind-tentacles” is as good as any I’ve come across. About mathematicians’ penchant for hiding the intuitive nature of the discovery, I can only say that I feel your pain. I feel it badly enough, to want to inflict the same agony on others ;). Alas, I am not that smart. But seriously, I was discussing precisely this with a friend (The same person who pointed out the mistake in my derivation.). It often happens that you make an intuitive guess, but to reach the answer, you have to make an number of simplifying assumptions along the way. My preference was to include those assumptions “in situ”, to depict that we are making an assumption because we require it to proceed forward. My friend, a vastly superior mathematician, discouraged this and said that I must enumerate all my assumptions *before* I start the proof. The advantage of this latter method is that it makes things neat and tidy; your proof has a collection of assumptions and a separate collection of logical statements that follow from those assumptions. The disadvantage is that the flow of the proof is lost. The reader will understand the proof, but he will not realize how I arrived at the result. Worse, he might be intimidated by the false impression that I had foresight to make so many non-obvious assumptions a priori which helped to make my proof a piece of cake. Nothing could be further from the truth. I’d love to read math saying: ‘ [..] oh, and then I remembered something my colleague had said about non-trivial solutions to such and such problem, and it triggered something else about non-holonomic manifolds, and although it had nothing to do with the subject nor the solution, I kind of looked at this connection sideways and found this other thing — but then I realised that it would not work unless the function was sufficiently well-behaved so that I could use this theorem, so I have to assume that the fuction is Cinfinity, even if in the end, I found out that I could sort of workaround that assumption [..]’ Maybe accompanying these mind ramblings would be the true formal proof, just to check that there is no flaw in the process. But I am pretty sure we’d learn much faster with such open-house math writing. And thank you for the comment about the existence of God. As a matter of fact, I tend to be an atheist for 99% of the practical stuff I do. I turn religious only in my ‘mellow moments’, and then yes, the God perspective gives them a special light that I really ‘worship’. Chris: 😉 I’m not sure what good that move would accomplish. But then, I’m not terribly good at chess. BTW, do you find it surprising that Akismet actually let that string of characters pass through the spam blocker. I do. 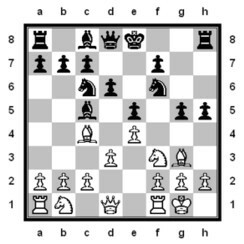 You are thinking the right thought though: “What should White do to checkmate Black?” :).